What is the ammonia level in your pond? Ask many koi keepers what level of ammonia there would be in a well managed koi pond and their answer will be: “Zero, of course”. But is that true? I cannot imagine a pond in which it is actually possible to achieve this value. Koi are ammonotelic. This is a fancy name for a living creature that eats protein and produces nitrogen as a waste product which is then excreted in the form of ammonia. OK, it’s no secret that koi excrete ammonia into their pond water, but do you know how much? A guide to the quantity of ammonia that is excreted by an active koi is 33 mg per hour per kilo of body weight. To put that a little more simply, a 1 kilogram koi will excrete almost 800 mg of ammonia into it’s pond each day. This is obviously only an approximation because it is dependent on diet and water temperature etc. but it is a surprising amount nonetheless. Few koi keepers will have any experience of pure ammonia. We also tend to think more in terms of body length than body mass. So it might make the ammonia output of koi easier to understand if we could stretch this example a little further by approximating body mass to length and if we also take into account that standard strength household ammonia is around 7.5%. Looking at it in this perspective, we could say that an average 20 inch (50 cm) koi, which will weigh about 2 kilograms, can easily excrete into it’s pond, the equivalent of over a teaspoonful of standard strength household ammonia every 12 hours. And that’s just one fish! Now think about your own pond and ask yourself the original question: What is the ammonia level in your pond? Clearly, as long as there are fish in it, the answer cannot be zero. There will always be some ammonia in the water because, no matter how fast is the turnover rate, it is impossible to instantaneously remove all that ammonia as quickly as it is being produced. The reason why many koi keepers believe they have a zero ammonia level in their pond is that a common method of testing for it is by adding a few drops of reagent to a sample of the water and then comparing the colour of that sample to a colour chart. Test kits based on this method are simply not sensitive enough to show very low levels and so it is natural to assume that no noticeable colour change means no ammonia. So, if we have to accept that there will always be a background level of ammonia in our ponds, how high can this level be before it becomes harmful? There is no direct answer to this question. When koi excrete ammonia into their pond, it breaks into two forms, free ammonia (NH3) and ionised ammonia (NH4). The proportions of each of these being dependent on pH and temperature, but it is only the free ammonia that is harmful. You will often hear that ammonia is more toxic at higher levels of pH and temperature. This is a simplification. At lower pH and temperatures, very little of the ammonia in the pond is in the free ammonia form, and therefore there is less of it to be toxic. As pH and temperatures increase, much more of the ammonia becomes free ammonia and so the toxic effects are greater. Free ammonia is just as nasty at low pH and temperatures. It’s just that there is far less of it. Scientists in the field of aquaculture have researched the effects of ammonia on fish and found that free ammonia levels below 0.02 mg/L were safe. Unfortunately, standard test kits and electronic meters cannot distinguish between free and ionised ammonia, they only measure total ammonia. 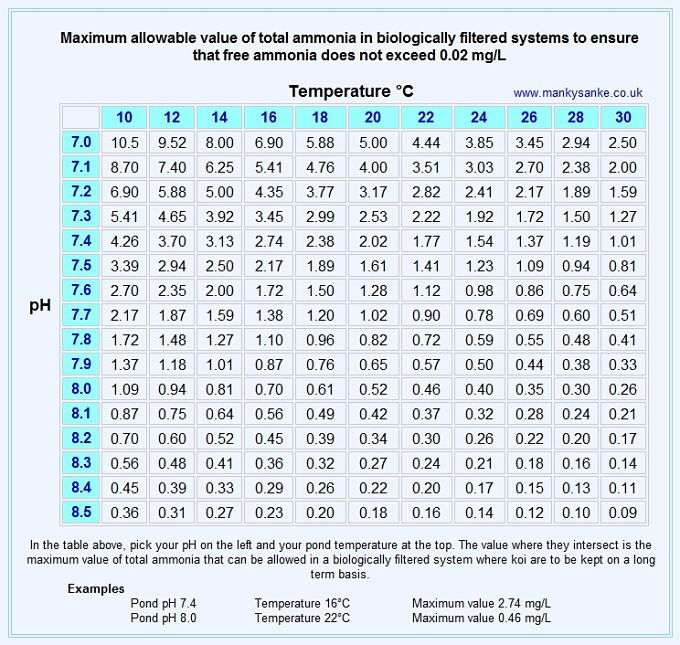 As a result of this research, tables were produced where, by looking up your particular values of pH and temperature, the maximum safe value of total ammonia can be found. These tables are commonly reproduced, but they cover the full range of pH and temperatures that are found in ponds and aquaria of all types, not just koi ponds. This wider range means that there is less room for detail in the area needed by koi keepers. So, with due respect to the authors of these tables, I have gone back to the original scientific research and recalculated a new table that gives the maximum safe value for total ammonia in koi ponds and quarantine tanks. By confining the table to the range that is found in koi ponds and quarantine tanks, it is possible to give greater detail in this range. As with other tables, look up the pond pH on the left, and temperature at the top. The maximum tolerable total ammonia is shown where they intersect. Click to see examples of the graphs and tables from the original research). In the two examples on the table, note the large difference in maximum tolerable value that is due to the increase in pH and temperature. The maximum tolerable value at the higher pH and temperature is about one sixth the first value. This is because, for any particular value of total ammonia, (as indicated by a test kit), six times as much of it will be in the toxic free ammonia form in the second example, so the maximum tolerable level of total ammonia has to be reduced proportionately. Now look up the maximum tolerable value if a quarantine tank at it’s top temperature of 30°C also has a high pH of 8.5. In this case, the maximum value of total ammonia is 0.09 mg/L. This is very difficult to achieve in practice. It should be borne in mind that, at this temperature, the koi’s metabolic rate will also be very high and so it’s ammonia output will be high as well. Resist any temptation to over feed at high temperatures when cycling a quarantine tank temperature up and down in order to trigger a latent disease such as KHV. That’s almost enough for one day, but before I let you go, one final point, and it is the most important one. It must be stressed that the values in the table above are maximum values. They are not targets. Whilst it is not possible to achieve a true zero value, it should be the aim of the koi keeper to achieve the lowest value that is possible, and to test regularly to ensure that this value is maintained. Liao, Spotte, Timmons and Wheaton did the original research in the field of Recirculating Aquacultural Systems. It was from the graphs and data they produced that I was able to calculate the values in my table.